Capturing more hell per cell than the 1998 cage match between Undertaker and Mankind, is Nightmare Pro Wrestling: a digitally drawn web comic from a husband/wife tag-team that chronicles a monster wrestling league created by mad scientist Dr. Nightmare, whose muscled combatants train and battle in a mansion built into the back of a giant, city-roving tortoise. As they typically are. The series follows the rise of a scrawny, skeletal fighter named Grave, who is accepted into the prestigious NPW based on his father Skull's hall-of-fame status, then unwittingly draws the ire of the league's most evil clique, The Horde, comprised of characters like chip-shouldered Devastator Dragon (who once dominated the rival Giant Monster Federation!) and Dr. Nightmare's undead daughter Britney, whose love actually is toxic. 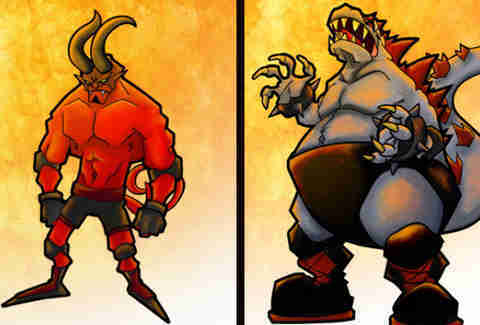 Other fighters include Grave's timid werewolf partner Lobo, the hot-tempered demon Grim, the washed-up superstar King Gorilla who can barely perform his signature finisher the "Atomic Primate", and tag-team belt-holders Dark Beard and the Jolly Rogers, who are really only in it for the booty. While you can flip through all the action online for free, they're also satisfying old-school collector types with deluxe print editions that come with bonuses like original sketches and mock-ups of the Nightmare championship belt, which you can hang up on your wall with Mankind's favorite weapon: the thumbtack.